One of the first things you should do when considering bidding on a request for proposal (RFP) is a bid/no-bid assessment. When responding to a request for proposal (RFP), you have to submit a compliant proposal. Below are four basic questions you should ask yourself when trying to decide if you want to bid or not. If you ask yourself these questions before you start putting pen to paper, you will be able to identify whether or not you will be able to submit a compliant response. Can you perform all the tasks listed within the scope of work (SOW)? If not, do you have a teaming partner who can fill in the gaps? The government is looking for a solution that covers all the functions outlined in the SOW. Unless otherwise stated, your response would be considered incomplete and non-compliant if you cannot provide a complete solution. If you cannot perform all the functions, you should have a subcontractor who can step in and help fill in the gaps. Do you have all the required certifications/regulations as listed in the RFP? If the contract requires that you have a facilities security clearance, and you do not have one, you will automatically be disqualified from responding. If the contract is an 8(a) set aside and you are not one, you can’t respond as a prime. If the contract requires that you have an office in California and you only have one in D.C., then you can’t bid. Basically, you need to review all the requirements and make sure that you comply with each of them. In some cases, the government will allow you to proceed if you don’t have a requirement in place that you bid, so long as it is put in place before the work starts. Do you have the appropriate past performance and key personnel to submit? This is a critical one. The government is looking for a contractor with a good track record. Past performance is how they judge your ability to perform on this contract. A strong past performance is one where you can show that you have done this type of work before and have history with the agency. That doesn’t mean that if you don’t have exactly that experience you can’t bid. You just need to have something similar enough for them to compare to. Many people skip this step, but it can actually be the most critical thing to do. While this is not a checklist you can make from reviewing the RFP, it could drastically effect whether you should bid or not. You want to invest your time and energy in opportunities where you have the best chance of winning. Before you spend the many hours it takes to respond to an RFP, it is wise to take some time and do some research. You will want to see if there is already an incumbent and if the agency is happy with them. If that is the case, it will be harder to take the business from the incumbent. Similarly, if this is a new requirement, you will want to see if another company has already been talking to the agency and helping them shape the requirements in their favor. If your research shows that the odds of you winning are slim, then chances are you will not pursue that opportunity. 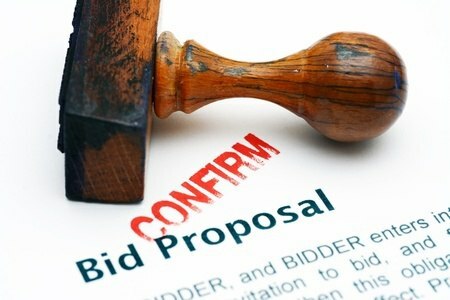 Should You Bid on the RFP? Generally, when it comes time to decide if you should bid for an RFP or not, your best chance for success will come from a clear understanding of the situation, the RFP’s requirements (and how you fit them) and how you compare against your competition.